LET THEM KNOW HOW MUCH YOU CARE! 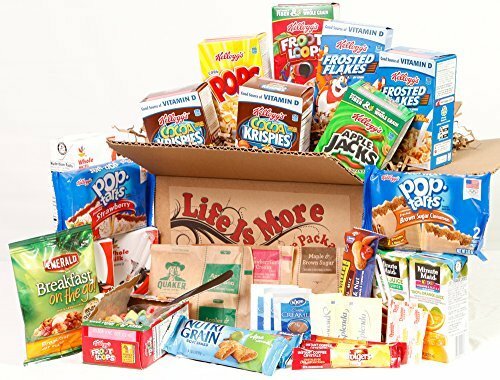 This School College Student Breakfast Care Package is made especially with all of your Loved One's morning healthy treats. Package includes: Kellogg's Cereal: 2 Frosted Flakes, 2 Cocoa Krispies, 2 Froot Loops, 1 Corn Pops, 1 Apple Jacks, 3 - 8oz cartons of real whole milk and a stainless steel spoon. It also includes: 3 Quaker instant oatmeals - Apple & Cinnamon, Strawberries & Cream, Maple & Brown Sugar, 3 Kellogg's Nutri Grain bars - Apple Cinnamon, Blueberry, Strawberry, 1 Nature Valley Chewy Granola Bar - Trail Mix, 2 6oz Minute Maid Drinks - Orange Juice and Apple Juice, 3 Folgers instant coffee with 3 Sugars, splenda and powdered creamer, 1 Emerald Breakfast on the go - Glazed Walnuts and 2 Kellogg's Pop Tarts - Strawberry and Brown Sugar Cinnamon. Help your loved one start their morning out right with this healthy Breakfast Care Package. Include your own personal message to your College Student. A great way to brighten your College Students morning. A brilliantly collaborated mix of quick breakfast items sure to satisfy any Students grumbling tummy. Keep your Student stocked up even if they are far from home. If you have any questions about this product by Life Is More, contact us by completing and submitting the form below. If you are looking for a specif part number, please include it with your message.